Carnival of space #302—the podcast Here at Cheap Astronomy, you can go with the podcast version (see above, right click—Save As… to download) or you can just go with the usual text version below. 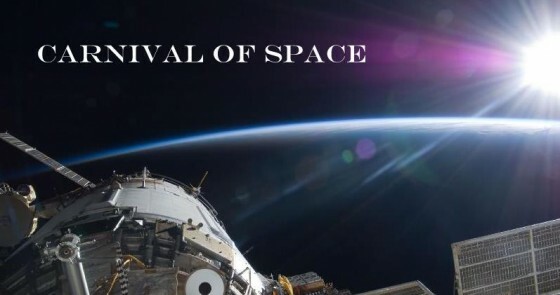 The Carnival of Space was created in 2007 by Henry Cate of the Homeschooling Blog and who then gave it to Fraser Cain of Universe Today and now it is continued by Brian Wang of Next Big Future. If you’d like to be a host for the carnival—or contribute to it, why not send Brian an email at blwang@gmail.com. Chandra describes how Black Hole Powered-Jets push away material at millions of kilometres an hour, starving the black hole of fresh material and building up the galactic bulge that lies about it. This process may explain the correlation between the mass of a supermassive black hole and mass of the galactic bulge it sits within – at least in larger galaxies, like 4C+29.30 which lies about 850 million light years from us. Here, There, & Everywhere visits Puerto Rico university and learns wisdom – and experiences some hands-on learning. Carolyn Collins Petersen, TheSpacewriter announces her new book, Astronomy 101: From the Sun and Moon to Wormholes and Warp Drive, Key Theories, Discoveries, and Facts about the Universe. Nextbigfuture presents some video clips of Commander Chris Hadfield demonstrating some of the simple things about life in space. There’s a clip of him doing Space Oddity with a few revised lyrics, which some of you might have seen before. Not bad for a Canadian. Nextbigfuture also reports that researchers have found that the beam of a scanning electron microscope can turn a naturally-occurring coating on the larvae of some insects into a sort of miniature spacesuit that can keep them alive in a vacuum for up to an hour. With this technology we may be able to send small animals wearing nano-suits to space, and there have also been early successes in nano-suiting small fish. Pam Hoffman from Everyday Spacer tells us that teachers and students are wanted to produce content for a crowdfunding campaign for “Teachers in Space”. The Meridiani Journal tells how the Curiosity rover ready to start drilling again after just coming out of its month-long “vacation” due to solar conjunction. The second drilling site has now been chosen, a piece of bedrock called Cumberland, which is only about 2.75 meters from the first drilling site, John Klein. The Astronomy Club Toutatis, in Kustavi, Finland have prepared a summer Space Exhibition right in their own backyard. Although of course, their backyard is in Finland. Catholic Sensibility also looks at Pioneer XI’s near-impact on Epimetheus during its 1979 flyby of Saturn. Scientists were concerned about it being obliterated by possible ring debris. It missed a small moon by less than 3,000 miles, which is 4,800 kilometres for anyone living outside the US or the UK.